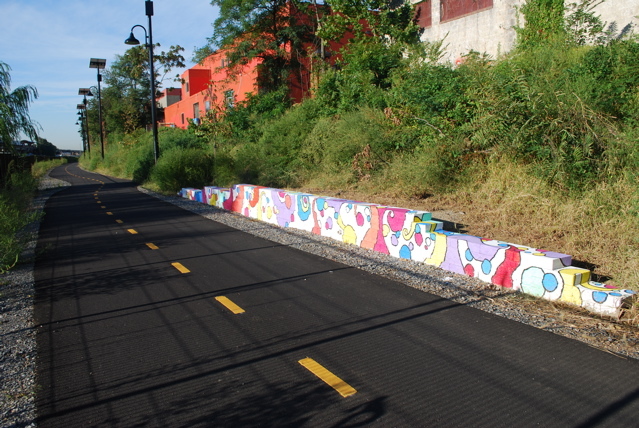 Stephen Miller, bicycle advocate and coordinator for Urban Pathways for the Rails-to-Trails Conservancy, will be hosting a Trail Safety Open House to discuss ways to protect users of the Metropolitan Branch Trail from crime, Wednesday, June 22, from 4:00p to 7:00p in the pocket park near S and 4th Streets NE. The Metropolitan Branch Trail is a shared use trail that runs roughly parallel to the former B&O (currently CSX ) right-of-way, mostly in the Northeast quadrant of the District. The trail will eventually cover approximately 8 miles from Union Station in the District to Silver Spring Metro Station in Maryland. Last May, an important segment opened that linked New York Avenue to Franklin Street NE and allowing a contiguous 1.5 mile car free route. Volunteers from the Guardian Angels to discuss the creation of a trail safety patrol. Initial plans as shown in the Metropolitan Branch Trail Public Art / Civic Design Sketchbook called for envisioned the conversion the of then fallow land into recreation / greenspace. While aspects of that plan are less certain today, this event will allow trail users an opportunity to discuss the future of the trail and current development surrounding it. YOU! Meet neighbors and trail users as we work to keep our communities safe. The forecast: Partly sunny with a 50 percent chance of showers and thunderstorms. Highs around 90. Don't worry, we'll have a tent to keep you dry if a storm comes by!